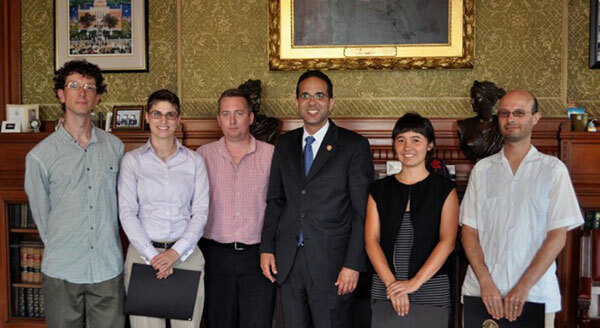 Providence Bike and Pedestrian Commission members: Matthew Moritz, Jenn Steinfield, Jef Nickerson, Mayor Angel Taveras, Jenna Yu, and Eric Weiss. I mentioned earlier in the comments section of the post about the announcement of the Bike and Pedestrian Commission that I had been asked to join the Commission, but figure I should do a separate post so people know. The Commission is being run out of the Office of Sustainability with a member of the Planning Department staff also attending and advising our meetings. We had an informal meeting this past Monday to be sworn in by the Mayor, get to know each other, discuss some of the responsibilities we have as Commission members, work to set a rough agenda, and set up our schedule of upcoming meetings. Our first official public meeting will be Monday, August 13th at 4pm (location to be determined still). After that our meetings are scheduled for the 4th Monday of the month at 4pm. I’ll be posting schedules and updates on the meetings as they happen. I was also waiting to see if there was a better photo to use before posting about this.